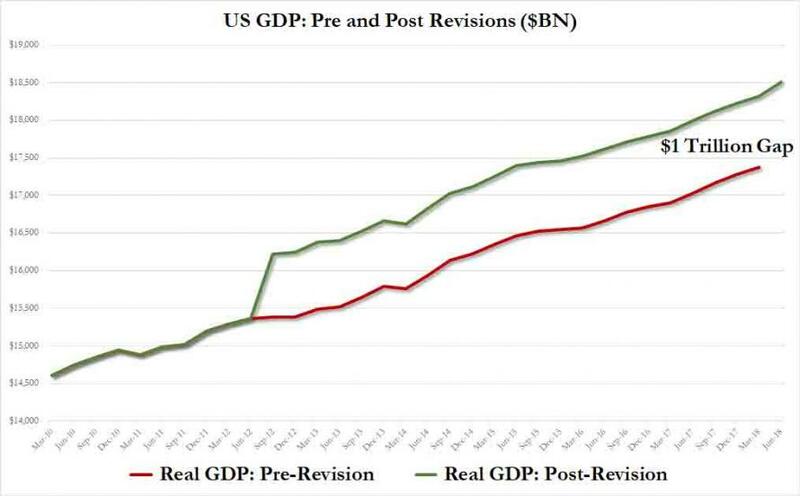 Earlier today, we reported that as part of the comprehensive GDP update carried out every five years by the Commerce Department’s Bureau of Economic Analysis and released today, US economic history was thoroughly rewritten and in a surprising, if welcome, development real US GDP was "found" to be higher by roughly $1 trillion, with business investment, especially in high-tech equipment, marked up. But another, even more surprising, revision emerged when looking at the BEA's fresh take of America's household savings rate, which was revised higher in 10 of the last 11 years in the latest update, and in the most recent years by a substantial amount. The reason for the revision: new IRS data showing that proprietors’ income was much bigger than previously known. 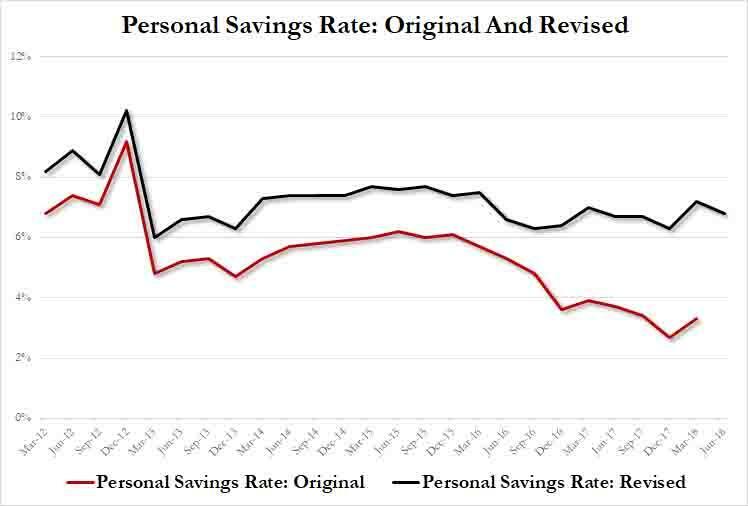 As an example, the increase in the savings rate meant that last year’s previously accepted rate of 3.4%, which was used by so many economists and strategists to warn that the US consumer is tapping out, was actually double that number or 6.7%. In the most recent apples-to-apples period, Q1, 2018, the savings rate was updated from 3.3% to 7.2%, a staggering revision. In addition to the IRS adjustments, the revision also reflected a change in the seasonal adjustment for employee compensation. And what is most notable, whereas previously the savings rate trendline over the past 5 years had been a secular decline, it is now effectively a flat line, as US household savings are virtually unchanged since 2013. Taken at face value, this would be great news for the US economy, as it would mean that all those surveys reporting that more than half of Americans don't have any savings, are likely bogus. Unfortunately, reading between the lines reveals that little has changed as a result of this revision when it comes to the broader economy, because as it turns out, most of the revision to savings in recent years came about because small-business owners and other proprietors made more money to salt away, not because workers got bigger wage increases. In other words, America's small businesses had stashed away far more cash than previously expected which is great news for them as it means they can invest far more cash than previously expected, or alternatively spend it; as for those 150 million Americans who work for someone else either full-time, part-time or as contractors, there was little to celebrate: your savings are still virtually non-existent. The question is whether the Fed buys this explanation, because on the surface, household savings of just over $1 trillion, or double what was previously thought, means that the Fed has far more room to hike rates than r-star, or the army of sellside economists, suggests.